15 | October | 2013 | What's love got to do with it? October 15, 2013 – What's love got to do with it? In his latest book, “Antifragile: things that gain from disorder“, the mathematician Nassim Taleb takes one example to illustrate his theory of a bimodal strategy to avoid antifragility. “Female in the animal kingdom (in some monogamous species which includes humans) tend to marry the equivalent of the accountant, or even more colorless, the economist, someone stable who can provide, and once in a while, they cheat with the aggressive alpha, the rock star, as a part of a dual strategy“. He adds it all boils down to the search of good genes and economic stability, which cannot be obtained in one man, as the rock star ( aka the good genes) isn’t someone stable. And the accountant/ economist (aka the economic stability) hasn’t the good genes. Well, I don’t really agree with Taleb, because nowadays, some economists are considered as the alpha males. Some get interviewed as if they were rock stars and found themselves in the same parties like the real rock stars. An example? Nouriel Roubini. This economist got famous for predicting the housing bubble in the United States. 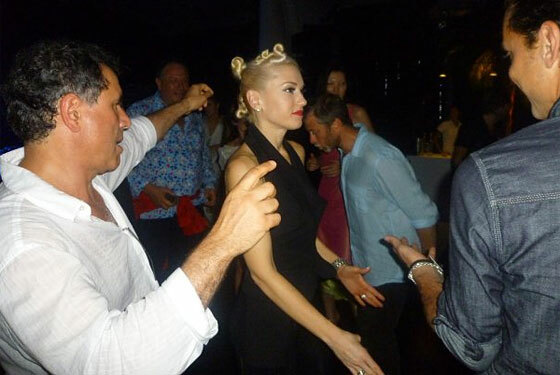 He’s on the left of the picture, dancing next to Gwen Stefani, the lead singer of No Doubt. At his place, his neighbors complained about the numerous parties he holds with models and “it” people. In France, they had also a case of an economist who has a thing for prostitutes and loves the spot light: DSK. And in my country, an accountant, who regularly features on the media, got into trouble for his car, licensed in another country: an Hummer. He likes to drive it around with various young women. The words “economic stability” don’t pop into my mind when I think about them. As for the good genes, well, it depends on the definition of it. If it’s the intelligent genes, then why didn’t Albert Einstein attract a lot of women? Besides, nowadays, as I see the alarming rate of divorce in my country, I can’t think there’s an economic stability with any man at all. Relationships are more complex than that. And love, by its nature, is fragile.